So my birthday was last week and my dear husband kept going on and on about this great birthday present he was going to get me. Then, on my birthday, he was in a panic and apologizing repeatedly because he still had not ordered said present. When he finally had time to order it, he was kept getting errors with the credit card. He knew there was plenty of available credit and that it wasn't close to the expiration date, so he assumed that it was a blocked website. Well, he tried a couple of days later and just like magic, he got it to go through.................. as soon as he changed the preselected Visa setting to Mastercard. Hahaha!! 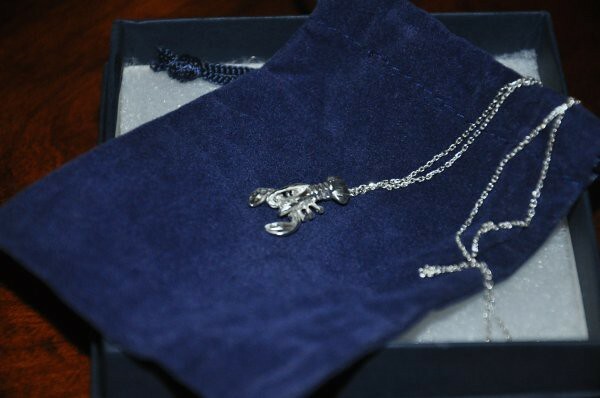 This lobster necklace was the first thing to arrive along with a card that said "You're my lobster". It's kind of an inside joke but if you're a Friends fan you probably get it. And if you haven't seen Friends, I highly recommend starting at season one and watching all ten seasons because it's the best. show. ever. Ahhh... true love! How sweet... and you're right, he does have GREAT taste!! Hope your bday was great!